Dusty tracks and desolate coast roads. Desperately bouncing the hire car down another cattle track, trying to beat the sun (or your flight home) to get one more surf in. It’s the standard modus operandi for many a surf trip, where the surfer’s mindset leaves little room for other considerations. It isn’t that surfers are shallow, or narrow-minded, or don’t take an interest in their surroundings — it’s just that, well, they like to surf. Yes, the medieval fortifications might be an “absolute must see,” but the four-foot offshore waves squash those plans without further consideration. Surfers are lucky. Most top-quality surf spots are in warm or tropical climes, generally not over-touristed, and are, by their nature, chilled out places to spend a few weeks. But that doesn’t stop a nagging feeling that maybe we’re missing out on some of the…what’s that word…oh: culture. Surfers can return home with tales of perfect left-hand point breaks and the best patatas bravas this side of Seville. Thankfully though, the surf gods decided that surfing and culture needn’t always be mutually exclusive. In a few hallowed parts of the globe, the two indeed live side by side in peaceful harmony. Northern Spain is one of these places. Surfers can return home with tales of perfect left-hand point breaks and the best patatas bravas this side of Seville. Northern Spain’s three major cities — and the coast between them — provide enough cultural and culinary fare to push those thoughts of 30° water and mechanical reef breaks to the back of your mind. For a few moments, at least. 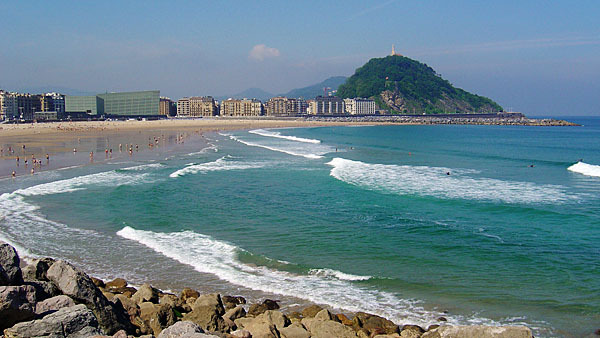 Assuming you’re traveling from east to west, San Sebastian will be first on the list. It’s perhaps one of the most surreal places in the world to surf. You might find yourself changing into your wetsuit in the underground NCP car park in the middle of the city before strolling — barefoot, board under arm — through town amongst Spanish businesspeople. Be prepared for some pinch-yourself moments as you join the masses waiting for the lights to change. The city’s central break, Ondarreta, is at the end of the high street. Having made the transition from smog to seafront, you’ll see that the bay is overseen by a huge statue of Jesus, his arm raised in approval as you pull off another perfect Spanish right-hander. The beach can get crowded and you’ll find yourself competing for waves, but it’s worth it, if only to say you’ve surfed there. 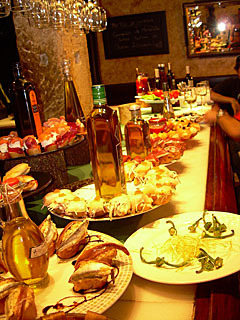 Back on land, San Sebastian stakes its claim as the capital of Basque cuisine and of the ubiquitous pintxos (Basque tapas). These tasty bite-size snacks are all the more delicious after a day spent in the water. Pretty much all bars have pintxos on offer, although you’ll have to make a swift assessment as to whether it’s a “help yourself” or “wait to be offered” affair to avoid getting your wrists slapped. Moving west towards Bilbao, make sure to stop at Mundaka, a surf town that’s been at the center of European surf culture for the last 40 years. The world-renowned break is perched at the mouth of Guernica estuary and is legendary for its fickleness. In 2005, following overzealous dredging by a local shipyard, the break disappeared for almost two years. But it’s back now, even if it only really turns on a few times a year. Some of the most talented surfers in the world make Mundaka their home through the Spanish autumn and winter, in the hope of surfing the wave when it’s on. It’s reckoned by many to be the best left-hander anywhere. Surfing aside, Mundaka epitomises sleepy Spain. Grabbing a coffee or taking a walk along the estuary almost merits the detour itself. If your nerves can handle it, it’s worth sticking to the coastal road as it teeters on the edge of sheer cliffs, which drop straight into the sea. It’s one of those drives that can be considered an “event” in itself. The suburban approach to Bilbao — along the banks of Río Nervión — foreshadows the town itself. Pretty and newly renovated houses give way to the rubble of a recent industrial past; rusting warehouses and a corrupted river reflect the Bilbao of old. As you approach the city, however, these warehouses fade into tree-lined walkways and cycle paths. Many have been converted into the apartments and offices that begin to line the river and are testament to the cosmopolitan reincarnation of the city. It’s only once the road melds with the river — as it meanders right and into the city’s hub — that you spot, on the far bank, the totem that has come to epitomize the new Bilbao: the Guggenheim Museum. From a cultural standpoint, it’s a must if you’re in the area. Inside and out, the structure will blow you away. 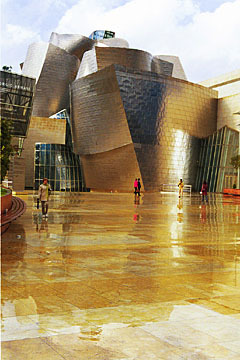 Bilbao is an animated and engaging city. Although there’s no surf on its doorstep, there’s a ton of fun to be had, especially if you time your visit to coincide with one of the many fiestas. The final metropolitan stop before beginning the run into the westernmost regions of Asturias and Galicia is Santander. In some respects it’s the ugly sister of the trio. Santander does little to disguise its industrial heart. Much of the city was destroyed by fire in 1941, and the sprawl that’s developed since has a practical, modernist feel to it. Elements of the old city do remain and are worth a wander, but it’s another department in which Santander succeeds in trumping both Bilbao and San Sebastian: its beaches. From the bustle of downtown, it’s a 10-minute walk to the kite- and windsurfing magnet of Playa de la Magdalena, or a 20-minute ferry ride to the vibrant Hossegor-style resort of Somo. There you’ll find great surfing and a fantastic beach vibe. And despite the very best of cultural intentions, it’s a fitting end to the trip. If you’re extending your trip south across the Strait of Gibraltar, Trips also has valuable info on Surfing Morocco. Beebe Bahrami’s Eat, Pray, Love in Spain is well worth a read if you want to explore more of the cultural and spiritual side of the country.